Any questions? Call 800-330-9552 or Contact us by email. Latex unlined gloves, latex flock lined gloves, latex knit lined gloves, neoprene over latex gloves, chemical resistant gloves, disposable gloves, protective workwear. 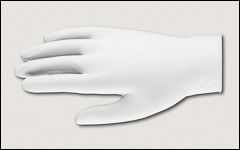 Unlined, flock lined, and knit lined latex gloves are listed below. And at the bottom of this page are the blue and yellow neoprene coated latex gloves. Permeation and degradation data is available to assist those qualified in determining general suitability of these gloves to your application. Other gloves are shown on our Abrasion resistant gloves and Nitrile gloves pages. Glove liners are shown on our Glove liners page. CAUTION: Latex gloves on this page contain natural rubber latex, which may cause allergic reactions. 4 mil West Chester 2500I, is a powdered, industrial grade, white latex ambidextrous glove. Economically priced with snug sensitive fit and maximum dexterity. Loose fit around wrist for comfort. Comply with FDA food handling requirements. 9 1/2" long. 100/box. 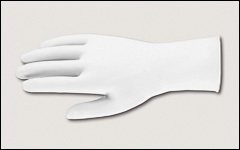 Ansell 69210 is a lightly powdered white latex ambidextrous glove. High degree of dexterity, strength, and comfort of latex with beaded cuff. Comply with FDA food handling requirements. 9 1/2" long. Sold by the box, 100/box. 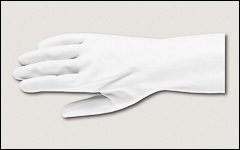 West Chester 2850 is a powder-free white latex glove with a textured grip. Gloves stretch for snug sensitive fit and maximum dexterity. Ambidextrous design fits right or left hand. Comfortable loose fit around wrist. Rolled cuff prevents tearing when pulling off and on. Made from component materials that comply with Federal Regulations 21CFR, 170-199 for Food Contact. 9 3/4" long. 100/box. 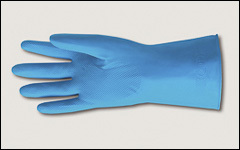 West Chester 2550, is a powder free blue latex ambidextrous glove. Extra heavy weight resists organic acids, alcohols, caustics, animal fats, ketonic solvents and mild detergents with rolled cuff. Silicone free. Comply with FDA food handling and NFPA Standard on Protective Clothing for Emergency Medical Operations requirements. 11 1/2" long. 50/box. West Chester 2343 is a premium PosiGrip™ amber latex glove. Unlined with embossed palm and fingers for grip and rolled cuff. 13" long. Individually packaged, but sold by the dozen. 18 mil West Chester 2312 is a flock lined yellow latex premium PosiGrip™ glove. Chemical, puncture and tear resistant with beaded cuff. Embossed palm and fingers give extra grip. 12" long. Individually packaged, but sold by the dozen. 12 dozen/case. 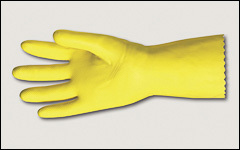 Ansell 198 is a flock lined yellow natural latex glove. Fishscale textured grip on the palm provides improved grip. Snag, puncture, cut and abrasion resistant with pinked cuff. Comply with FDA food handling requirements. 12" long. Sold by the dozen, 12 dozen/case. West Chester 52L102 is a flock lined blue latex premium PosiGrip™ glove. Chemical, puncture and tear resistant with pinked cuff. Embossed palm and fingers give extra grip. 12" long. Individually packaged, but sold by the dozen. 12 dozen/case. 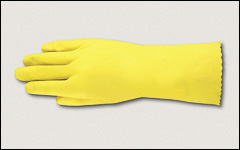 Ansell 297 flock lined yellow natural latex glove. Fishscale and embossed pebble palm provides improved grip with pinked cuff. Snag, puncture and abrasion resistant. 12" long. Sold by the dozen, 12 dozen/case. 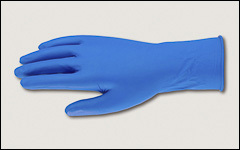 Ansell Hy-Care 62400 is a medium weight, double dipped, fully coated, blue latex glove. Crinkle cut grip with pinked cuff. Excellent for wet applications, chemical processing and fiberglass work. Comply with FDA food handling requirements. 12" long. Sold by the dozen, 6 dozen/case. 28 mil West Chester 2224 is a flock lined, blue/yellow premium PosiGrip™ glove. Unsupported neoprene over latex gloves with added durability and protection. Chemical resistant with outstanding dexterity. 13" long. Individually packaged but sold by the dozen, 12 dozen/case. United Industrial Sales Co., Inc.